London & North Western: a name that excites the imagination and charged the atmosphere with great achievements in the realm of railway enterprise. One of the LNWR’s less fashionable engine sheds forms the background to this work, a shed where there were no household names and few famous engines – its stud being drawn from a worthy assortment of hard slogging dividend earners. Situated half a mile north of Huddersfield on the Manchester-Leeds route, Hillhouse Shed was animated by highly contrasting fugures possessed of many good human qualities, and a few with a share of human failings. Men whose words and humour deserve recall and whose stirring deeds quickens the blood. Remembrance of past generations of men and engines is tempered by the fact that of all the characteristics with which humans are endowed, it is often by some particular incident that they are remembered. 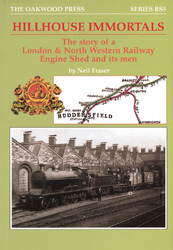 Here is the story of men who left their own indelible mark in railway history. A5 format, 112 pages, 113 illustrations.